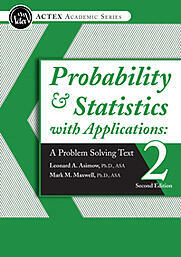 Mark Maxwell, ASA, PhD, is a co-author of Probability and Statistics with Applications: A Problem Solving Text, (ACTEX, 2015). To celebrate the release of the text's 2nd Edition, this month ACTEX sat down with the authors and discussed their approach to developing this textbook, among other things! Maxwell joined the faculty at the University of Texas - Austin in summer 2009 as Clinical Professor of Mathematics, Paul V. Montgomery fellow, and to direct the UT Actuarial Program. He served as program director of actuarial science and math department head while collaborating with his co-author Dr. Leonard Asimow, a professor of mathematics and actuarial science at Robert Morris University. ACTEX Learning (AL): What do you like most and least about writing books? Mark Maxwell (MM): Creating questions is a favorite activity. Each semester I like to construct an entirely new comprehensive final examination for my probability class. Discovering typos after our book is printed is least favorite. Losing several hours of work due to issues with technology and my failure to save work is my penultimate favorite. AL: What is your creative process like? MM: Many of the questions in our text came from life experiences. For example, determining the probability of winning three prizes under the lids of 12 coke bottles was inspired by the time I won three prizes under the lids of 12 coke bottles. Early each morning I walk my two dogs for an hour (so they are less likely to destroy my house). When I am not scolding Harmon and Lilly for chasing cats, squirrels, armadillos, and/or skunks, I like to think about an activity to try in class or how to combine probability concepts for an exam question or textbook exercise. Early morning voicemails and e-mails to myself are common. Note: Dogs are currently 0 for 4 against skunks. AL: How do you stay focused? AL: Tell us a little bit about your hobbies (outside of actuarial science)? MM: I enjoy playing bridge, playing basketball, attending cactus league spring training baseball games, and working outside my cabin on the Colorado river. Traveling and spending time with family and friends is great. Sometimes activities are accompanied by cold beer. MM: "Drive Right. Pass Left"
It would be a fictional book where drivers were thoughtful, considerate, and used the passing lane to pass. All drivers would signal, stop at stop signs, and not block intersections. Drivers would not litter. Drivers would pay attention. I know that my plot is way too unreasonable. AL: What first led to this book idea? MM: After I sat for my last actuarial exam, I discovered a lot more free time. The original idea was to create a teaching notebook. I compiled former exam questions and began to make detailed notes for a probability class I was teaching at Robert Morris. Once Len Asimow and I began collaborating, then we had a worthwhile project. If something is well written, then we can thank Len. If something is obnoxiously written, then we can thank me. AL: How was the process different than you would have imagined it? MM: We had a nearly completed draft of our text prior to contacting ACTEX. AL: What advice do you have for other aspiring authors? MM: Life is short. Do things that you enjoy and fulfill you. Try to minimize activities that you do not enjoy are rob you of your most undervalued commodity (time). "Instant success typically takes about 15 years." AL: Do you have an interesting or funny story to share from your career or the book writing process? MM: I do, but the statute of limitations has yet to expire. AL: What do you find most rewarding? 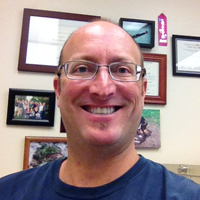 MM: The well-earned accomplishments of my students: 1) Watching a smile form on the face of a student because they made a connection warms my soul, 2) I dig emails from students with the words "I Passed!" in the subject line, and 3) Students appearing 3 inches taller because they just received a job offer from their first choice employer. AL: In addition to not littering and driving right, what advice do you have for students? MM: While doing homework, you should write your best possible solution and not try to "get the answer" as quickly as possible. Many people would benefit by eliminating the words "uh", "um", "so", "like", and "it" from their vocabulary. "I'm not going to lie, you know".